The last statue was removed in July 2016, but on removal for some TLC was found to be too badly damaged. The last statue was made of polychrome carved wood and was carved by Arnold Smith in 1991. David Mitchell is a recent graduate of Gray’s School of Art Aberdeen, with a BA (Hons) Sculpture. 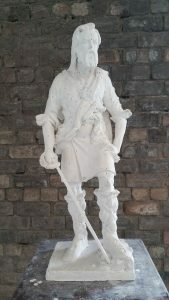 I am a figurative sculptor working in glazed terracotta, plaster, bronze and marble. My work seeks to capture not only likeness but also life, energy and spontaneity. I work from my studio in Glasgow, where I undertake bespoke commissions for clients as well as producing gallery work and proposals for large-scale public works. Since graduating from art school last year, I have produced a large body of work which has been displayed and sold in a number of galleries. I have shown work in London, been shortlisted for awards and hosted my first solo exhibition. I have had the privilege of working on a range of projects in the studio of Alexander Stoddart (Sculptor in Ordinary to Her Majesty the Queen in Scotland) and have gained valuable knowledge and experience under his guidance. I am working on an ongoing basis on a series of sculpted portraits for which a number of well known Scots have graciously agreed to sit. An exhibition of these works are being planned for a future date.